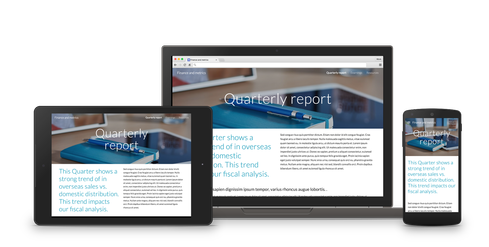 Google for Work customers can look forward to finding content and sharing it more efficiently with Springboard and a revised version of Sites. At Google Atmosphere in Tokyo on Tuesday, Google introduced a new Google Apps product and a substantially renovated one -- but not for everyone yet. The latest additions to the company's enterprise portfolio -- a Google Apps search tool called Google Springboard and a reimagined version of Google Sites -- are being made available to interested Google for Work administrators through an Early Access Program rather than as a public release. Over the years, Google has made much of the fact that with cloud computing, it can make innovations available to customers immediately. But that's too soon for many businesses. So Google has slowed things down for its enterprise customers. While such deference seems appropriate now that Google's enterprise business is being run by industry veteran Diane Greene, it predates her arrival. For example, in 2009, Google decided to offer a Scheduled Release Track for Google Apps in response to customer demand for a more manageable pace of innovation. At large companies, there's more concern about not breaking things than having the latest thing immediately. Google isn't alone in having to moderate its product development cycle to accommodate cautious corporate IT groups. Mozilla faced a corporate backlash in mid-2011 for adopting a rapid Firefox release schedule. By fall that year, its enterprise working group had proposed an Extended Support Release program to make Firefox a better fit for businesses. But the measured pace of IT groups doesn't mean there aren't pressing problems. "When it comes to the enterprise, one of the issues we see come up a lot is it's very difficult to find and distribute the right information to the right people at the right time," said Ryan Tabone, product management director for Google Docs, Sheets, and Slides, in video conference interview with InformationWeek last week. Corporate content can exist in many different locations and different business groups, with different sharing rights, said Tabone. "This has become a source of pain for enterprises," he said. 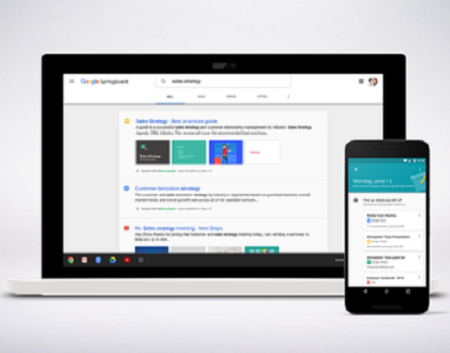 Google Springboard lets Google for Work users perform keyword searches across all of their Google Apps content. 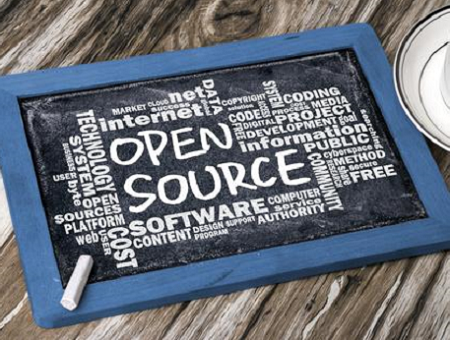 It performs a function similar to the Google Search Appliance, but for content in Google's cloud rather than content stored in corporate repositories and databases like SharePoint or Documentum. Springboard's goal, said Tabone, is to make it easier to find, aggregate, and distribute corporate information. "It's unified, it's one search results page, but the content is customized to you." Google's individual apps like Gmail are known for having strong search capabilities. But Springboard can find content throughout Google Apps, in Gmail, Calendar, Docs, Drive, Sheets, Slides, and more, assuming Google for Work administrators have set the appropriate permissions. Eventually, Tabone said, Springboard will index third-party content, too. Google's approach to productivity, said Tabone, has been to help users achieve their goals rather than simply give them additional tools. He pointed to the way the company has employed machine intelligence in Inbox's Smart Reply and in the Explorer function that's part of Sheets. "[Productivity] is not just you should send 10 times more emails," said Tabone. "It's how you get to your goals faster." Where Google Search is a "pull" service that delivers information in response to keyword queries, Springboard includes machine intelligence to add "push" capabilities as well, like Google Now. "There will be actional information and recommendations specific to you that will come up," said Tabone. For example, when you go into a meeting, Tabone explained, Springboard might provide you will documents you used the last time you attended this meeting. "And it does this in a secure way," he added. "We're not going to show something that you don't have access to." Once people find information, they often want to do something with it. That's where Google Sites comes in. "The UI is pretty basic, and that's intentional," said Tabone. "The goal is for you to focus on your content ... not on all of the tools you need to figure out to make it look correct." Sites now incorporates machine intelligence to perform tasks like automatically adjusting the brightness and contrast of a background image when text is placed on top of it, to ensure the text remains legible. It also generates a responsive layout that works across a variety of screen sizes, resizing and cropping pictures while keeping the subjects of images in frame. The point, said Tabone, is to eliminate time-consuming design challenges from your workflow. Tabone said it was a challenge to balance what was left in and what was left out of Sites, because, while people always say they want more controls, additional controls tend to be used by only a few people. Google for Work administrators can sign up for access to Springboard and the reworked Sites through the Early Access program links provided on the company's blog post.